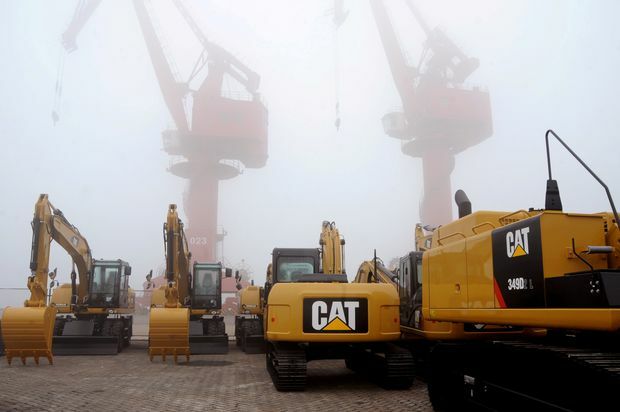 Caterpillar Inc. machines are seen at Lianyungang port in Jiangsu province, China, on Jan. 21, 2018. Simmering concerns about the slowing Chinese economy and rising global trade tensions turned more alarming on Monday after a new round of influential U.S. companies reported disappointing outlooks, citing China as a key factor. Caterpillar Inc., which makes heavy equipment used in construction and mining, missed analysts’ expectations with its fourth-quarter results and said that revenue growth in China would likely turn flat in 2019, marking a significant slowdown after two years of strong growth in the region. The shares fell 9.1 per cent. Nvidia Corp., which makes chips used in computers and driverless cars, cut its outlook for its fourth-quarter results, due to be released on Feb. 14. The company reduced its quarterly revenue forecast by US$500-million, to US$2.2-billion, noting “deteriorating macroeconomic conditions, particularly in China.” The shares fell 13.8 per cent. Caterpillar and Nvidia represent a small slice of the U.S. market. But they follow similar warnings from Apple Inc. and FedEx Corp. previously, and they represent a broad swath of global companies that have turned to China for growth, which is why their forecasts dragged down the broader stock market. The S&P 500 fell 20.91 points or 0.8 per cent. The United States and China have been locked in a trade battle for the past year, marked by stiff tariffs on imports that are raising production costs for companies and squeezing profit margins. The two countries are set to resume trade talks on Wednesday, in Washington, but the Trump administration has threatened to raise tariffs on US$200-billion worth of Chinese goods if a deal isn’t reached by March 2. “Because the macro data from China, like any emerging market, has its issues and perhaps isn’t going to fully reflect the reality on the ground, I think that’s why there is so much sensitivity to some of the earnings reports,” Douglas Porter, chief economist at BMO Nesbitt Burns, said in an interview. The market volatility comes at a time when U.S. fourth-quarter financial results are flowing at a rapid pace. Within the S&P 500, 123 companies are set to unveil their results this week, including Apple, Boeing Co., Facebook Inc., Microsoft Corp. and General Electric Co. According to Refinitiv, a blend of reported and estimated earnings for companies in the S&P 500 points to fourth-quarter profit growth of 14.2 per cent, year-over-year. While that’s strong, it has fallen from expected profit growth of 15.8 per cent on Jan. 1. Similarly, revenue growth has slowed to 5.6 per cent from 6.3 per cent at the start of the year. Canada’s S&P/TSX Composite Index rose 12.57 points, or less than 0.1 per cent, on Monday, suggesting that most Canadian companies have less direct exposure to the downturn in China. Mr. Porter noted that China accounts for about 5 per cent of Canadian exports. But the conventional wisdom suggests that Canada is more affected by China indirectly, through the effect that China’s economic growth has on commodity prices. The price of copper, which is crucial to industrial applications, has fallen 17.4 per cent since June and perhaps is already reflecting a slowdown. The S&P/TSX materials sector, which includes gold producers, has slumped 12.2 per cent over the same period. Energy stocks have fallen 18 per cent since July. “In general, commodity prices looked like they were staggered late last year and early this year. And a lot of it was based on specific concerns around China, which is seen as the key bellwether for how the global economy is shaping up this year,” Mr. Porter said. Softer U.S. corporate financial results and increasingly real concerns about China come as the U.S. Federal Reserve is set to announce its monetary policy on Wednesday. Financial markets do not expect the central bank will raise its key rate from the current range between 2.25 per cent and 2.5 per cent. But some observers believe that rate hikes over the past three years, including the most recent one on Dec. 19, put the Fed in a bind as it confronts evidence of slowing economic activity at home, such as declining manufacturing activity and economic uncertainty abroad. David Rosenberg, chief economist at strategist at Gluskin Sheff + Associates, believes the Fed is facing a U.S. recession. “Monetary policy influences the economy with lags that are long and variable. There is nothing the Fed can do now that can prevent the recession as the lags from the prior tightenings percolate through the economy this year,” Mr. Rosenberg said in a note.